Harrogate Town bounced back from their midweek defeat to Salford City by beating Maidenhead United 2-1 to move back into the National League’s top three. Callum Howe’s sixth strike of the season handed Simon Weaver’s team an 11th-minute lead, the big centre-half getting on the end of Mark Beck’s header back across goal from a probing George Thomson corner. The visitors went on to take charge of Saturday’s contest, Ryan Fallowfield going close before Jack Muldoon fired against a post. Top-scorer Muldoon then looked to have a simple tap-in just a couple of yards out following a goal-mouth scramble, but was denied by some superb last-ditch defending on the home goal-line. Disaster struck for Town in the 25th minute when goalkeeper James Belshaw picked up a Kelvin Langmead back-pass and Reece Cole’s free-kick was diverted into the net by Adrian Clifton. Just before half-time, Harrogate passed up the opportunity to restore their lead, Jack Emmett shooting over the top after United stopper Carl Pentney parried a Muldoon effort into his path. The second period began with Howe powering a header from another Thomson corner narrowly too high, before Josh Falkingham also went close. The game’s decisive moment eventually arrived in the 78th minute as Leesley’s corner dropped for Langmead to sweep home on the turn. Leesley almost added number three, shooting against an upright late on, however the North Yorkshiremen had already done enough. Town are now seven points behind leaders Leyton Orient with a game in hand. In National North, Bradford Park Avenue moved three points clear at the top of the league thanks to a 2-0 victory at AFC Telford United. FARSLEY CELTIC moved within six points of table-tpppers Nantwich Town with four games in hand following their 2-1 victory at Mickleover Sports in the Evo-Stik Premier Division on Saturday. The hosts took the lead a minute into added time before half-time. Ben Turner’s cross gave Adam Prusa the chance to hit his shot into the ground and beyond Kyle Trennery. Celtic started the second half strongly and the equaliser finally came on 57 minutes, when from a centrally placed free-kick, Will Hayhurst curled his effort past Lewis King. Farsley’s winner came on 76 minutes when Dave Syers was adjudged to have been fouled in the penalty area and the Celts were awarded a penalty. Up stepped Ben Atkinson who confidently fired home past King to seal the three points for Farsley. 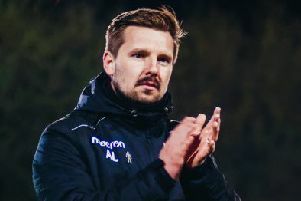 Third-placed Tadcaster Albion had to settle for a 2-2 draw with fourth-placed Brighouse Town despite having led twice in their Division One encounter. Billy Whitehouse gave Albion a 19th-minute lead before Aaron Martin equalised for Town on the half hour mark. Joe Lumsden restored Tadcaster’s lead on 65 minutes only for Zeph Thomas to level things up 10 minutes from time. Despite a brace from Frickley’s Sam Cable, Pontefract Collieries claimed a 3-2 victory in a West Yorkshire derby on Saturday. Pontefract’s goals came from Spencer Clarke (2) and Eli Hey. Elsewhere, Ossett United lost 4-1 at Wisbech Town while Pickering Town drew 0-0 at Stamford. A hat-trick from Joshua Garbutt helped third-placed Knaresborough Town record a crushing 6-0 victory at basement-side Harrogate Railway in the NCE Premier Division. The other scorers for Town were Daniel Thirkell, Brad Walker and Robert Youhill. Seventh-placed Hemsworth MW lost 1-0 at Maltby Main but Garforth Town enjoyed an excellent 4-1 win at Goole AFC with Mark Simpson netting a brace. Liversedge went down 6-0 at Eccleshill United. In Division One, Selby Town lost 3-1 at Dronfield Town, Glasshoughton Welfare lost 3-2 at basement-side FC Bolsover and AFC Emley drew 0-0 at Grimsby Borough.